A hydrophobic material is one which repels water. Household examples include coatings for non-stick frying pans and smartphones. Hydrophobicity also plays a key role in nature, for example, in mechanisms by which certain plants and animals harvest water from the atmosphere, and the packing of DNA into chromosomes. In recent years, it has also been revealed to be part of the function of acid catalysts, acidic materials that can speed up chemical reactions, widely used in the petrochemical industry. 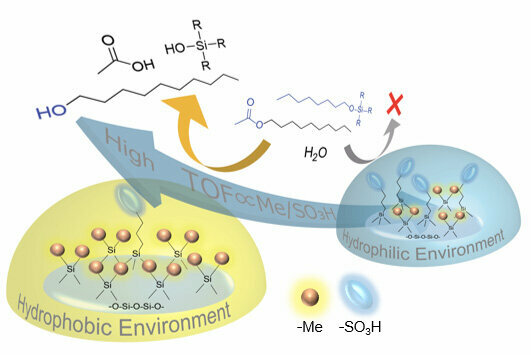 Though it was widely known that more hydrophobicity led to better catalysis, it was not clear why this was the case due to the heterogeneous porous structure of the most common catalysts.